Which sub $500 goto telescope should I get? With excellent help and advice from members here, I purchased an Orion XT8 several years ago and enjoyed it quite a bit. Unfortunately, a back injury has made it virtually impossible for me to use the XT8 any more since I simply can't bend over to pick it up and move it without a lot of pain. So, I'm in the market for a smaller, lighter telescope that I can move around without hurting myself, but that will still allow for pretty good views of the skies. I know that I'll be sacrificing a significant amount of light gathering potential by going smaller, but a smaller telescope that I can use is a LOT better than a bigger one that I can't use. I'm also very interested in getting a telescope with a motorized GOTO mount, in part for the times when I'm feeling lazy and just want to see something without hunting around in the stars, and to make it easier for the younger viewers (I have a 6-year-old nephew who recently discovered those sparkly things in the sky) to find interesting objects. * Ability to use my 1.25" Zhumell 9mm eyepiece, particularly since it seems that scopes in my budget range frequently come with low quality eyepieces. Not a requirement, but would be nice since I already have the Zhumell. * Potential for basic astrophotography. This is not a high priority, but could be a fun bonus. My preferred budget is around $500 or less. This does limit things, but I'd really like to stay below that if possible. All three look like they have potential benefits and downsides and I simply don't know which style would best fit my needs. I'm going to list what I see as the important factors so you can let me know how they relate to the different options and if any of them actually matter or not. The 130 SLT Newtonian - I'm already familiar with this format from using the XT8. Collimating the mirrors is relatively simple for me now, but might be a hassle if the cheaper, smaller scope doesn't hold the collimation as well as the XT8 does. It also seems like the eyepiece location is going to be at a more comfortable height for relaxed standing viewing than the other two, particularly when looking at objects that are high in the sky. Focal length is a LOT shorter than the XT8, but there are times when that is a good thing, such as looking at the whole moon or at big objects like the Andromeda Galaxy, and smaller eyepieces are always an option for higher magnification, with a 4mm eyepiece (or the 9mm Zhumell and a 2x Barlow) getting to almost the same magnification as the 127 Mak with its included 9mm eyepiece. The 127 SLT Maksutov-Cassegrain - The apparent primary feature of this one is the long focal length in a very small package. This is great for looking at planets, for close up views of the moon, and for bringing smaller DSOs in closer. But I've read that they don't do as well for normal DSOs because that higher focal length/magnification makes it harder to get everything into the viewing area at the same time. If I'm doing the math right, this scope would need close to a 60mm eyepiece to "zoom out" to the equivalent of the other two using their included 25mm eyepieces. The 102 SLT Refractor - This one is a full inch smaller than the other two, but it seems like that might not be a big issue since it also doesn't have the obstruction from the secondary mirrors in the other two. Since it is a straight refractor, I believe this would be the best option for astrophotography in the future, and it would also serve a nice secondary job as a terrestrial telescope for looking at wild animals during the day at the primary viewing site (cabin in the mountains). I've seen some reports of this telescope having issues with chroma, but I don't know if it's enough to really matter. The main downside I've seen to all three of these is also their main positive feature. From what I can tell, the Celestron computerized mount that these telescopes use doesn't have the ability to be disconnected to just use the telescope as a normal alt-azimuth mount for free roaming of the sky. If that's true, it could be a little annoying, but isn't a deal breaker as long as the motorized controller has the ability to make the telescope manually "roam" in addition to going directly to the pre-programmed objects. I appreciate any suggestions you can give me to help narrow this down and get me outside again. Of the three choices, I think I would prefer the 127 SLT. Yes, it has a narrower field of view than the other two, but I suspect the optical quality would be better, and not having to collimate as often would be a real plus. The 102 refractor could be a good choice, but the false color of the achromat may get a bit much at times. If you could swing it or find one used, the Nexstar 6 SE would be a great choice. Lightweight, excellent optics, and a touch more aperture. Which if quick enough can get for under 500 in classifieds right now. You did your homework, your observations are spot on. The Refractor is more of a low-medium power DSO scope, as it will struggle on bright objects or at high magnification due to chromatic abberation. But it is fast cooling and will do a bang up job on open clusters. You can slew to targets manually but it is a bit of a pain. Could check out Meade Observer series too. The 4" Mak Cat from Celestron is a very good scope, have one myself, it has a rather narrow FOV but is good on planets , the moon , and bright DSO's and the NextStar GOTO works very well and is easy to set up. Of the three, I also think the 127 SLT is the best choice. I have owned a couple of 130 SLTs and while it has potential, the scope is just too much for the mount and the quality of the components like focuser are not up to the task. The SLT refractor is pretty clunky and under mounted. The 127 OTA is a reasonable match for the SLT mount and offers sufficient aperture. A 5SE or a 6SE seems like a more robust mount with a good optics. Just be aware that for $500, you will be taking a hit in terms of quality as well as aperture. The XT8 not only delivers 8 inches of aperture for a very reasonable price, it is also a super-stable scope with smooth and accurate motions and a good though not great focuser. To get comparable quality in Go To scopes, I think the Nexstar 5SE is your minimum choice, and the Nexstar 6SE would be better. Getting a SLT mount with slow, long focal tubes is not a good recipe for deep sky AP, even if could get nice pictures of planets, moon etc. Said so, I used a 3.5"MCT on the SLT mount: the scope is really small (I went to Pamplona from Pavia in a small Polo car with this) and probably is the most stable model in the SLT line, but need a pretty dark sky to observe DSOs. With the 5" would trade stability for "reach" and resolution: a worth trade if do not have other options, but I eventually decided against it (to be honest, my 5" is heavier than that bundled with the SLT). In any case, if want to try also the thrill of conventional long exposure AP, I'd suggest to look for a second hand smarteq or eq3, and get the tube can afford with the spare money. The used 6SE, if in good condition, would definitely be a step up from the options I had listed. It is definitely heavier than what I was hoping for, at just under 29 pounds, compared to around 18 pounds for the other Celestron telescopes but should still be a lot easier for me to move around than the XT8. I'm a bit nervous buying the used electronics/mount, particularly from someone who has even fewer posts here than I do, but I'll look into it more. How hard is it to get a mount like that repaired/replaced if there is a problem with it? It looks like the mount/tripod combo is around $500 new from Celestron or HighPoint Scientific, so I'd have a problem if it had to be replaced any time soon. If the motors or electronics were to fail, can that mount be used like a normal alt-azimuth telescope mount or is it basically locked in place like the smaller mount that the other three telescopes use? edit: The used 6SE was already sold last night, so I went shopping around a bit..
HighPointScientific has the 6SE listed for $799. That's the same price as the base telescope directly from Celestron, but includes 15mm and 32mm Plossl eyepieces, a moon filter, and a 2x Barlow. Would that package be worth considering over the 127 SLT? It's definitely outside my planned budget but it could be doable if the improvement over the 127 SLT is significant enough to be worth about double the price, and if I'm not able to find another used 6SE for a good price. Edited by MichaelBird, 19 March 2019 - 08:55 AM. I own a 6SE and a 127 mak (Orion), that I use on an SLT mount. I’ve used both the 102SLT and the newt. And I own two 8” f/6 dobs. While I love the views the dobs provide, the scope I use most is the 6SE. I am a visual guy. The SE’s goto lets me see more objects in a session. I think that neither the SLT or SE mounts are terribly useful for ap, other than for dabbling in it. Especially, if you don’t adapt them to EQ mode. I don’t mind CA on visual DSOs, personally. The f/6 102SLT can be used with a minus violet filter to cut the fringing for the Moon and planets. Note: getting a used 6SE may mean needing to touch up the collimation, initially. If you don’t care to fuss with that, a new 127 or 102 might be the way to go. Buying a new 6SE doesn't change that one bit. Every piece of equipment I own, with the exception of a few of my eyepieces, was purchased used. And that includes something on the order of 10 motorized/GoTo mounts for myself and friends, from EXOS2-GT's to CG-4's with motors to my CGEM-II. Not a problem with a single one of them. I just bought a used SLT mount for my Infiniry 102. It works great and fits in a Harbor Freight soft tool bag. It's light weight and accurate. My only complaint is the range of motion from horizon to zenith for the refractor. My Nexstar 8 has a permant mounted OTA and weighs in at 35 pounds. The 6 SE may come in 3 components to reduce the weight of any piece. That might be the best buy if it works for you. Thank you all for the information and suggestions. I think I'll keep watching every place I can think of for someone to post another used 6SE for a good price, and if nothing shows up before I want to buy in about 4 weeks, to have the telescope for a 10 day trip to really dark skies at the family cabin in about 6 weeks, then I'll force myself to decide at that point whether to buy the MAK 127 SLT, or make a new 6SE fit into the budget. I bought a used GoTo mount off CN classifieds. It worked ok. Certainly not perfect but functional. I bought a used GoTo mount locally. Never used, like most telescopes listed on local bargain sites. Funny that a locking knob on a tripod leg was broken off, and the tripod case was torn and one of the zippers didn’t work. And the GoTo doesn’t work right. I can’t even use the motors to center an object in the FOV. But I got my self a 10 year-old never used GoTo scope. I’m sure those flaws were from the factory. For the price I paid, it was worth it. I can always part it out and sell it for a small profit if I cannot get the GoTo working. But I would be very wary of buying a GoTo mount off a local deal site. At least on CN you are buying from knowledgeable people who can accurately describe the condition and hopefully have a good track record of ratings. Beats buying from someone who found it for $50 at an estate sale but couldn’t figure out how it works. None of the entry level mounts and scopes are suitable for astro-imaging of the traditional kind, many long subs, processed after the fact with specialized software. There are people who say, and I believe them, that they have been able to get impressive results using one or another of the SE mounts on a wedge. But that really is exceptional and very rare. What you can do with almost any of the go to alt az mounts is give so called EAA (aka video, live imaging, observing with a camera) a try. There are many reasonably priced CMOS cameras using sensors such as the 290 and 224 that will give you a nice image with exposures of <30s and free/low cost software that can align and stack the frames on screen as they come in and as you watch. See more detail and see it color even from a suburban/urban site. In my personal telescope journey I think I made most of the mistakes that people warn against, but I learned something about the Celestron SLT, both versions of the SE mount and all of the good and bad of the CPC mount, plus a very short time with an entry level iOptron. If I were to do it again I would not buy a Mak or SCT, instead I would have gotten a newt or refractor in the f/5 to f/7 range but definitely on a go to mount. I would do it knowing that it wouldn't be a lifetime setup or the setup for all purposes and places. I would try to find used setup in good working order. I wouldn't worry about included EPs or other accessories. I still have a C-5 that was sold new as a spotter and which I bought used at a very low price. It sits on a used 8 SE mount on a used CPC tripod (two lighter tripods are in the garage). The default EP is a used Vixen zoom. A used 4SE picked up very cheaply was actually a good little scope and go to mount for planetary and brighter DSOs. The ETX90 at least the older models are also pretty good. Both are Maks yes, but can be a good value. An 80mm or larger achromat at no more than f/7 is also a good choice because of the wider field. Put on a Barlow and get a useable >f/10 scope. Take a look at the iOptron entry level go to setups, either the mounts or the complete kits. From what I read and from the one example that I saw in use, these are undervalued. Buying used is a great strategy but you have to be patient and careful and learn to walk away. Only two of the nine scopes I've owned were purchased new. Only one of the used scopes was a seriously bad deal, I have three scopes now in regular use, two of which, a refractor and a C-9.25 were purchased new. Edited by barbarosa, 19 March 2019 - 03:03 PM. With a bad back, a little bit extra weight makes a big difference. I would encourage you to consider the SE4 or SE5, either new or used. Regarding manual star hopping, I have the EVO mount. I just slew to object using the up-down left-right arrows. Often I can find items quicker than programming or searching with the go-to computer. Oh my goodness. My 2c is none of them. You should get no go-to telescope system that costs less than $500. Do so only if you wish to know the meaning of pain. I wanted to update this thread and thank you all for your suggestion on the Celstron 6SE. I have seen them before but never actually considered buying one because I thought they "looked weird". I found one that's practically new through the Classifieds here, so that worked out nicely. I still think it looks a little weird, but the view through the eyepiece and usability of the telescope are what really matter. And on those subjects, I have to say WOW! Viewing from home is pretty terrible with Bortle 7/8 skies, but I did manage to get a little bit of play time yesterday when the spring storm clouds cleared up for a while. Alignment with the Two Star Auto option was super easy and really effective. My youngest daughter had fun playing with the goto function, scrolling through the options presented in the sky tour. 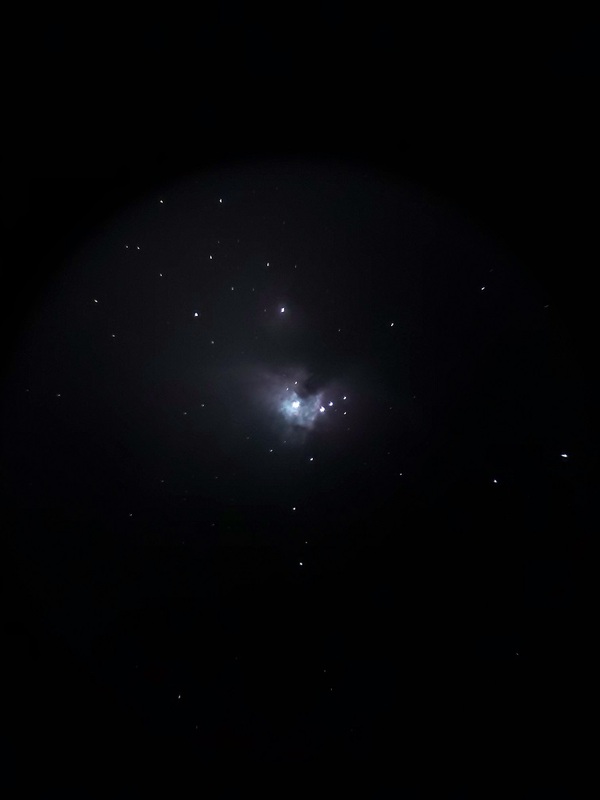 Most were not visible in our bright skies, but we got a great look at the Orion nebula (with a lot more visible than I ever saw in the Orion XT8) as well as a few of the brighter star clusters and some double/multiple stars. She's almost as excited as I am to get the telescope up to dark skies at the cabin in about 5 weeks. On a surprising side note, I have a GoSky cell phone adapter that clamps a cell phone onto the telescope eyepiece. I had some fun using it as a "view screen" to share views of the Moon with the XT8, but never could get anything else to really show up on the phone screen with that telescope. Just for kicks, I decided to try to take a picture of the Orion nebula through the 6SE, and while it's obviously not calendar worthy, it turned out surprisingly well for a single snapshot using a cell phone held up against the eyepiece! I'm definitely going to try it on other DSOs at the cabin, since Orion will probably be too low in the sky to do it properly by the time we get up there the middle of next month. Good to hear, Michael. Those 6" Schmidt-Cassegrains are fine all-around scopes. Have fun with your early explorations! For a smartphone without manual control settings built into the onboard camera app, like manual focus, exposure time, maybe ISO, an app called "Nightcap" could be used. Huawei Mate from version 9 upwards onboard camera app that can do all that. I think quick pictures can serve as a nice documentation for an observation log, if you have a printer. Oh, I just realized something. The very act of beginning an observation log might be particularly attractive for your daughter, too. I remember when I was a girl, I liked the act of organizing, designing a template on paper with ruler and columns, handling sheets of paper, ordering a bunch after a fashion one day, re-ordering them the next day by a different topic. Don't know, I think it gave me the impression of playing grownup working in an office? Such activity made the paper sheet collection an extension of my own self. Some boys like to constantly order and re-order baseball cards, too? Except for the act of designing your own template and then filling in the information by hand, with several colours and the most beautiful handwriting manageable. Manually handling actual paper, writing and drawing information on it and organizing the growing collection - that was the main thing, somehow. Meaning, a computerized log wouldn't have been attractive. Not "holistic" enough an experience to keep me interested. A computer log leaves nothing visible in my room to draw me back time and again, re-connect with my "extended self" and then improve upon, re-organize, re-invent. My best friend from kindergarden onwards had similar attraction to keeping logs and organizing. So it can't have been very un-girlie what we enjoyed beginning at age 9 or 10 or so. But then - there were no computers around when we were girls. And we didn't have access to telescopes, either. So, once she has spent a few minutes on separate nights at the eyepiece, you two could discuss a way to log her forthcoming sessions and which details would be worth to log repeatedly. Not merely the Messier number... more like "was the milky way visible and where in the sky?" for seeing conditions and time-of-year. "Which eyepieces were used and how was the viewing experience with each?" "What did we look at and what shape was it?" "What did we GoTo but did not see?" "Who else was there, did Mom have a peek as well or why not?" "What did each of us like most and how did we describe what we saw and liked? " The list of details to log doesn't have to be comprehensive or even resemble real observing logs from the get-go. The act of improving in stages, adding or removing as she sees fit from one day to the next, is a major part of the fun. And if it doesn't get touched for a few months it's alright, too. During the initial experience, some new neuronal network will have been created which wouldn't be there otherwise. My best buddy later became a biologist and I myself had the most fun with writing SQL scripts... both professions are somewhat related to the neuronal pathways created when we were 9 and handling information we stored on sheets of paper. If you have a back issues there's not a better option than a seated observing position using a fork arm SCT.